1. 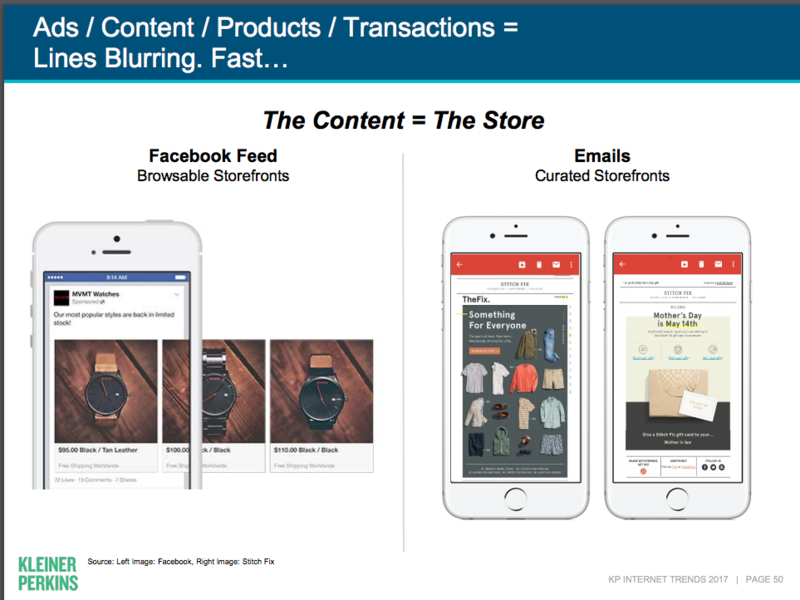 The content = the store. We couldn’t agree more. At Salsify, we believe that product content is the new brand marketing. Our recent research found that 87 percent of shoppers starting their shopping on either Amazon or Google, the only differentiator between you and your competitor is how you present your products. A well-researched and detailed product experience that includes reviews, features, images, videos, etc., is critical for attracting would-be customers, and a determining factor in attracting and keeping repeat customers. 3. A magic combination: Online + offline engagement. 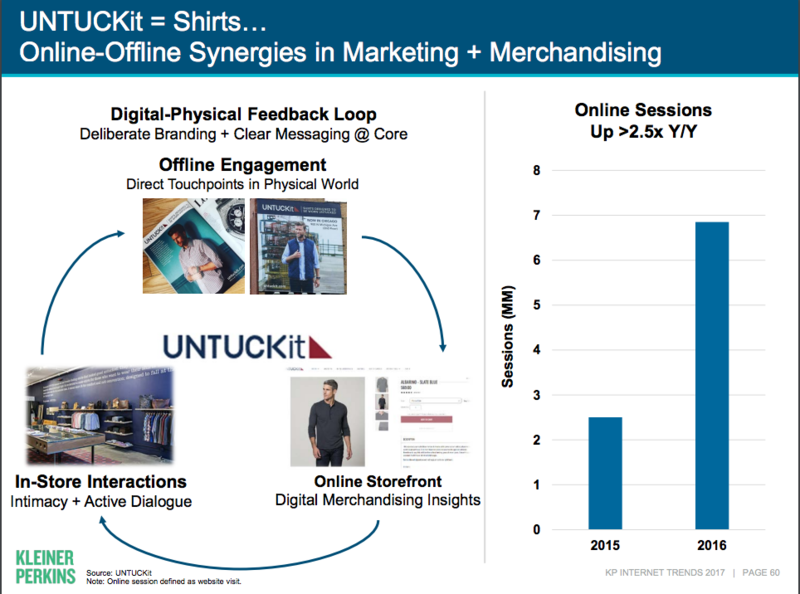 Meeker references men’s apparel retailer, Untuckit (and a Kleiner Perkins portfolio company), as a good example of combining online and offline feedback into its brand experiences. 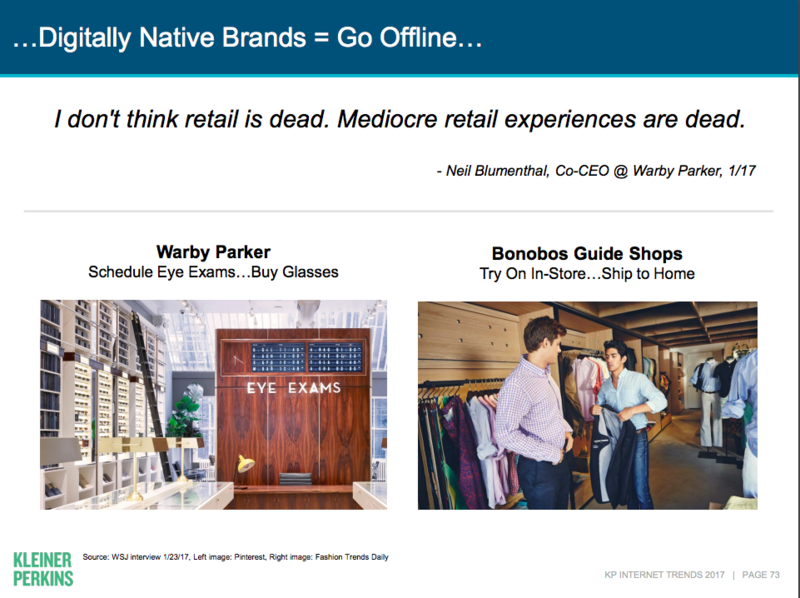 Retailers need to understand that online and brick and mortar don’t compete - they complement each other to boost customer experience. Think Petsmart’s store grooming experiences and Home Depot’s refocus on expert guidance. These in-store efforts will play larger and larger roles for retailers as they transform in the constantly evolving digital age. 4. Shopping channels are expanding and more diverse than ever. There are several pages in the report on where and how people buy things. Where via Google search, social, voice, mobile, etc., there is one unchanging factor: delivering the right product content to the right person at the right time creates a happy and loyal consumer. Getting this right entails a collaboration between brands and retailers; together, they hold the right mix of data that drives the creation of rich experiences and provides insights so they can deliver product content that shoppers need to make choices - whenever, wherever and however they shop. Historically, geography was the greatest factor in determining where people spent money. With today’s endless supply of sellers looking for your business, experience has replaced geography as the reason customers buy from a particular retailer. Since convenience and price are covered by Amazon and Walmart, product content is your best catalyst for differentiating through experience. Making strategic plans for your company's future? Get a free copy of our market research to better understand where other brands and retailers are investing and how industry leaders are winning the sale.